The San Antonio Spurs lead the Oklahoma City Thunder 2-1 in the west, while the Cleveland Cavaliers are in control in the east. THE SAN ANTONIO Spurs held off the Oklahoma City Thunder 100-96 in game three of their Western Conference semi-final NBA play-off on Friday. Oklahoma City huffed and puffed on home court, closing to within two points late in the final quarter but San Antonio overcame the challenge to take a 2-1 series lead. After Tony Parker converted a pair of free throws to put the Spurs up by four, the Thunder then hit back to make it a two-point game with 4.8 seconds left on the clock. But the Thunder’s hopes of a comeback were eventually dispelled by Kawhi Leonard, who showed tremendous composure to nail two free throws 2.7 seconds from the end. Leonard finished with 31 points and 11 rebounds in a double-double display, aided by LaMarcus Aldridge’s 24 points. Thunder pair Russell Westbrook (31) and Kevin Durant (26) combined for 57 points. The Cleveland Cavaliers are a win away from back-to-back series sweeps after rallying to beat the Atlanta Hawks 121-108 in game three. Trailing 2-0 in the Eastern Conference semi-final, the Hawks needed a response and they got, leading 63-55 at half-time and 91-85 heading into the final quarter. The Hawks also led 103-99 with just over eight minutes remaining in Atlanta, however, the top-seeded Cavaliers dominated down the stretch to earn a 3-0 series buffer. Cleveland, who saw off the Detroit Pistons 4-0 in the first round, were led by Channing Frye’s 27 points, which included seven three-pointers on the road. LeBron James (24 points, 13 rebounds) and Kevin Love (21 points, 15 rebounds) both contributed double-doubles, while Kyrie Irving posted 24 points. Al Horford had 24 points for the Hawks, who face elimination when they host the Cavs in game four on Sunday. Email “Spurs take series lead, Cavs poised to sweep Hawks in the NBA playoffs”. 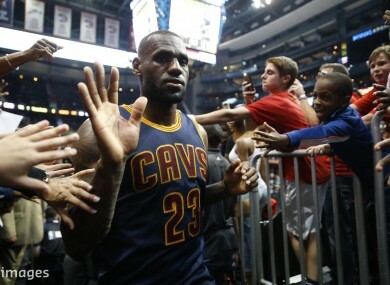 Feedback on “Spurs take series lead, Cavs poised to sweep Hawks in the NBA playoffs”.